Sustainable Ocean Summit 2017 in Halifax, Canada. • The growth of the Ocean Economy and its contribution to food, energy, transport, communications and other needs of society as part of the U.N. SDG process/Agenda 2030. • The role of the Ocean Business Community over the next 15 years, and beyond, in ensuring ocean sustainable development. This conference has attracted those interested in industry leadership and collaboration to address ocean sustainability, science and stewardship. Around 250 representatives from shipping, oil and gas, fisheries, aquaculture, ports, mining, finance, renewable offshore energy, tourism, marine technology and other industries, as well as representatives from other key ocean stakeholders attended. • Business Growth and Investment opportunities through Ocean Sustainable Development. • Building on the results and momentum of the U.N. Ocean/SDG 14 Conference (June 2017), the “Our Ocean” conference (October 2017) and other ocean events of 2017. The results of this SOS 2017 will feed into WOC and ocean business community efforts to address ocean sustainable development and the Sustainable Development Goals of the UN. I spoke on behalf of Mangrove Action Project, representing one of the few environmental/ social issues non-profits attending the conference. In assessing my involvement, I feel it was important because I brought a rather unique and very needed perspective to an otherwise corporate interest related event. The bulk of the conference speakers spoke from the economically sustainable and innovative industry viewpoint with a profit-oriented perspective, with little emphasis on conservation and nature- based solution approaches. Towards the end of the first plenary session, in one intervention I was able to highlight this serious lack of focus at the conference on the environmental perspective, and used the example of industrial aquaculture and floating city platforms being lauded by certain plenary presenters as great steps forward in meeting our civilization’s challenges in the years ahead. I felt that the planet and its myriad life forms, including mangroves and humans, needed to be seriously considered in the overall picture. This limited corporate approach to development and so-called “progress” failed to represent the bulk of life on this planet, and in fact was a threat to all life itself. My intervention came early on in the conference, and near two- dozen persons attending approached me to thank me for my intervention. On the 2 nd morning of the conference I was part of a panel of presenters. I gave my powerpoint presentation on the important benefits and services that mangroves provide, highlighting the importance of mangroves in the effort to reduce climate change. 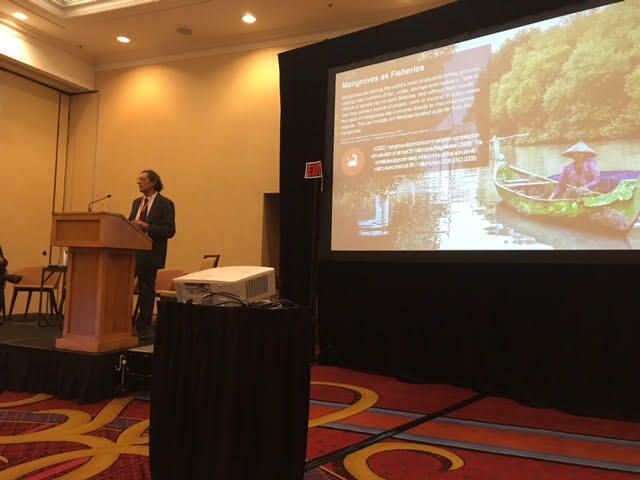 (please see the link to view the presentation itself)The audience was receptive and appreciated learning about these amazing forest wetlands that can help reduce CO2 buildup while protecting coral reefs, sea grasses and coastlines from erosion and rising seas and dangerous weather events. The WOC-SOS conference was a good outreach opportunity for MAP, where both Roan and I met many conference participants. Many business cards were exchanged and some excellent organizational contacts were made, with potential partnerships for future collaborations arising from this event. All in all, it was important that representatives of MAP attended this event.